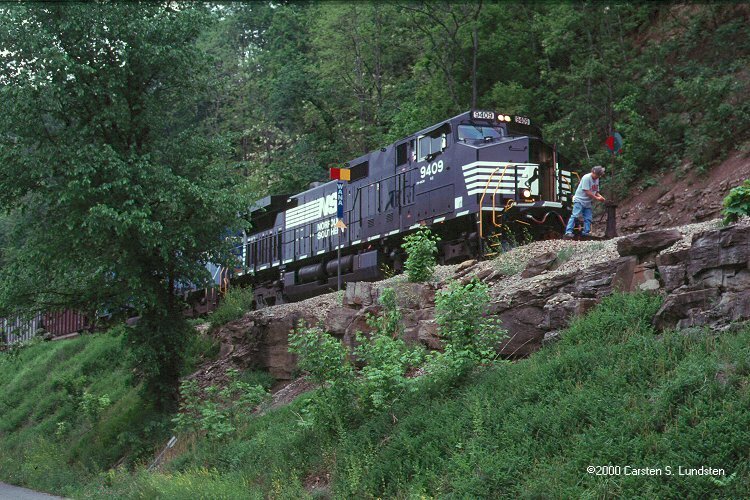 This is an unofficial Norfolk Southern and CSX Railroad railfan page. This page has no affiliation with Norfolk Southern Corp or CSXT Corp. 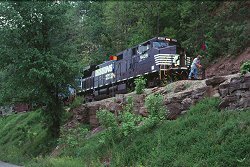 The Monongahela Railway (MGA) was a coal hauler owned jointly by the Pennsylvania Railroad, the Pittsburgh & Lake Erie Railroad and the Baltimore & Ohio Railroad. 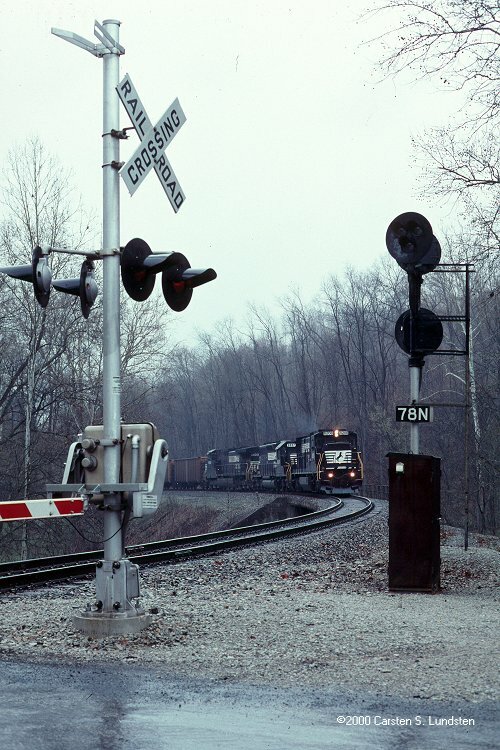 Today this railroad belongs to the Norfolk Southern, taken over through the Conrail merger. 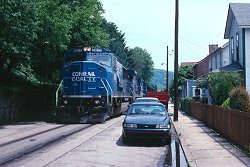 Conrail (as PRR successor) had taken over the Monongahela Railway in 1993, in a deal giving P&LE/B&O successor CSX has trackage rights on the former Monongahela Railway. The ex MGA starts in the North at Brownsville/West Brownsville. NS has a little yard just north of West Brownsville. 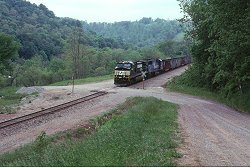 This yard serves as a short time staging yard for loaded and empty NS coal trains to/from Peters Creek Yard south of Pittsburgh. 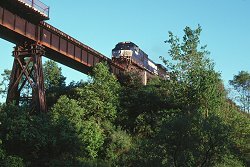 Trains are recrewed at West Brownsville. From West Brownsville trains can either cross the Monongahela River to Brownsville and go south on the Loweridge Secondary or (as most trains do) head south towards Waynesburg. 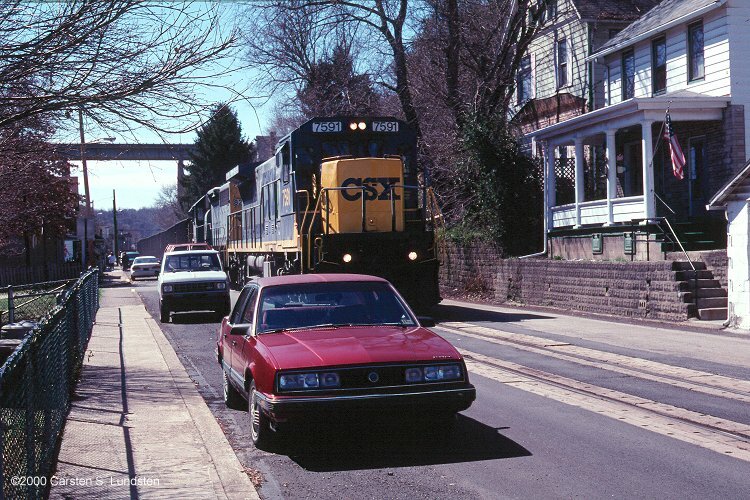 CSX trains join the ex MGA from the north at Brownsville, then either proceeds south on the Loweridge Secondary or (as most trains do) across the Monongahela River to West Brownsville and head south towards Waynesburg. 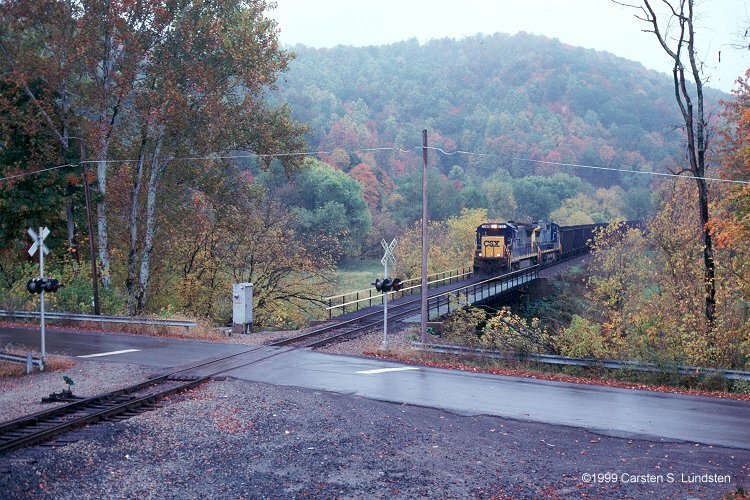 Waynesburg is the end of the ex MGA mainline (now the NS Mon Line). At Waynesburg the Emerald Mine is the destination/origin of some trains. 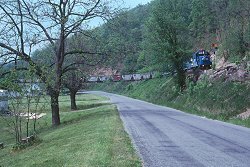 Most trains continue on the Manor Branch towards the Bailey Mine. 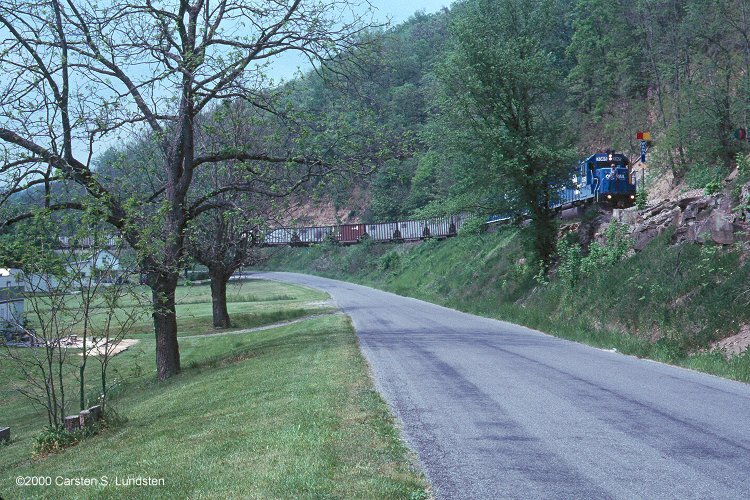 From Waynesburg trains may also proceed on the Waynesburg Southern Branch to Blacksville. The Waynesburg Southern services 3 mines, the Blacksville #1 mine at Blacksville (out of service, some fly-ash is taken there from time to time), the Federal #2 Mine on the Miracle Run Branch and the Blacksville #2 mine on the Wana Industrial Track. The ex MGA mainline is operated under Centralized Traffic Control, CTC. The Manor Branch and the Waynesburg Southern Branch are both operated by radio permits and thus makes the railfan's task much easier. But even on the CTC mainline there is quite a lot of radio talk. All northbound trains ask for permission to go through West Brownsville, in order not to be stopped and block the whole town. The ex MGA is dispatched by the NS Mon Valley dispatcher. In 1999/2000 about 25-30 daily trains ran on the ex MGA. Sundays were almost completely dead but the other weekdays were busy. The photos I've selected or this page unfortunately only represents the West Brownsville to Waynesburg line and the Waynesburg Southern Branch. I did shoot a few pictures on the Manor Branch but none on the Loweridge Secondary (which carries very little traffic). The street running through Main Street in West Brownsville is well known to Western PA railfans. And it is certainly something that should not be missed by visitors to the area. It's fascinating to see the mile long "streetcars" glide down the street, and there are plenty of them! 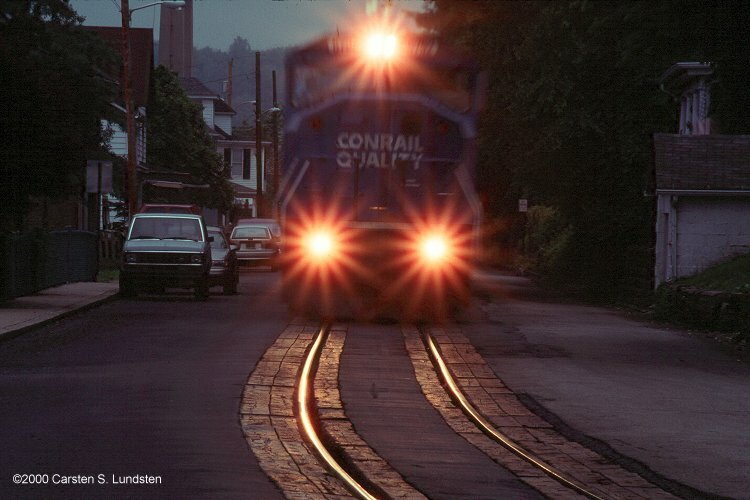 Southbound train, June 1999. 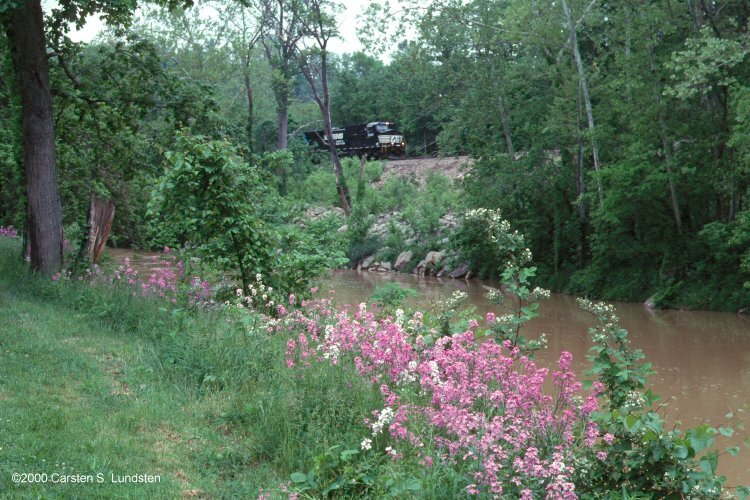 Another day, spring 2000. Northbound CSX loads head up Main Street West Brownsville. 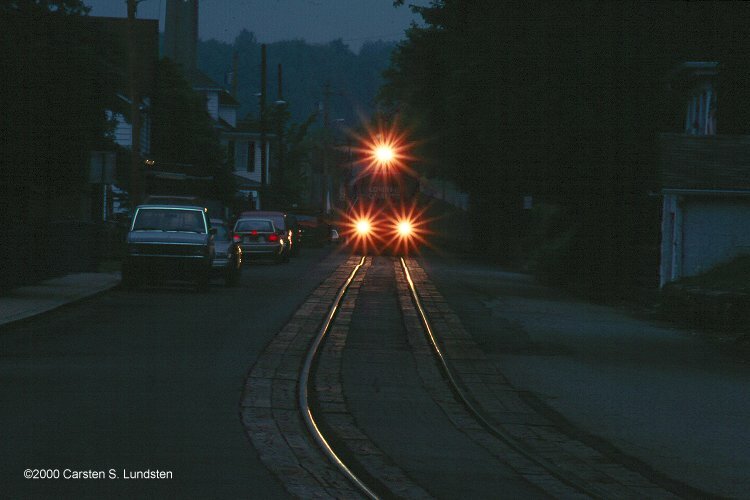 A May evening 2000 the light gave the nicest stars around the headlights of this northbound NS train heading through Main Street West Brownsville. Southbound train between Mather and Waynesburg. Circa April 1st 2000. About a mile further towards Waynesburg. Northbound coal. May 2000. The Waynesburg Southern branch probably offers the most scenic spots of the former MGA. Trains are dispatched by radio permits and speed is low (10 mph). Unfortunately this also means that trains can be far apart, so getting trains, weather and the sun's position to cooperate usually takes a few tries. Not that this photo was from one of the successful days. Southbound empties near White Cottage, just before the tunnel. May 2000. Northbound loads on the trestle near Buzz. May 2000. Southbound empties for the Blacksville #2 mine. The train is at Wana and the conductor prepares to throw the switch to the Wana Industrial Track. May 2000. Some days later another train throws the switch at Wana. It's early October 1999. Hazy day but the fall colors are beginning to show up. Northbound CSX loads from the Federal #2 Mine approaching the wye that connects the Miracle Run Branch to the Waynesburg Southern Branch.